« What is the mechanism of dyspnea in Tetrology of Fallot ? 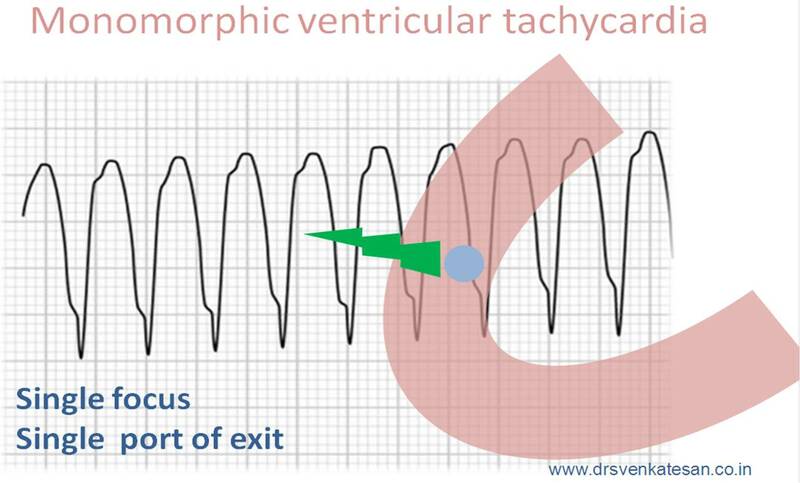 Different “Avatars” of ventricular tachycardia : Multifocal vs Polymorphic VT ! Ventricular tachycardia can be classified in a variety of ways. Monomorphic VT and polymorphic VT is one such classification based on VT morphology.Polymorphic VT generally conveys a meaning of origin from multiple focus .But in reality bulk of the polymorphic VT originate from a single focus . How does a single focus have a multiple QRS morphologies ? This is possible because , even though VT arises from a single focus , the route it takes to exit from the myocardium is different and hence they inscribe different QRS morphology for each beat. It is also possible , as the conduction time varies with each exit route the VT becomes irregular. This phenomenon is called polymorphic VT. It is assumed the VT focus is often located in the sub endocardium and breakthrough occur in the epicardial side as we record the activity in the surface ECG. Electrophysiology of VT is not that simple , focus of VT can be anywhere , the focus can be single or multiple and exit pathways can also be multiple it and it may even exit into endocardial cavity . Please note , even a single electrically abnormal cell shall act as a focus . To confuse us further , some of VTs may not exit at all , extinguishes before reaching the surface. It is a difficult job to fix a given polymorphic VT to arise from a single focus or from multiple focus . Multifocal VT can be diagnosed with confidence only after a through electro physiological study.Clinically few clues are there. Electrolytic disorders and ischemia are usually multifocal, while scars VT gives single focus .Other famous example of polymorphic VT are Torsedes de pointes . Polymorphic VTs are usually hemodynamically unstable but it is not a rule. Surprisingly ,some of the polymorphic VTs are well tolerated . This is especially common in multi focal polymorphic VTs which are hemodynamically and electrically better off . Ironically , presence of multiple focus may be a blessing as they compete with each other , in the process pulling down the other focus from triggering a VF . 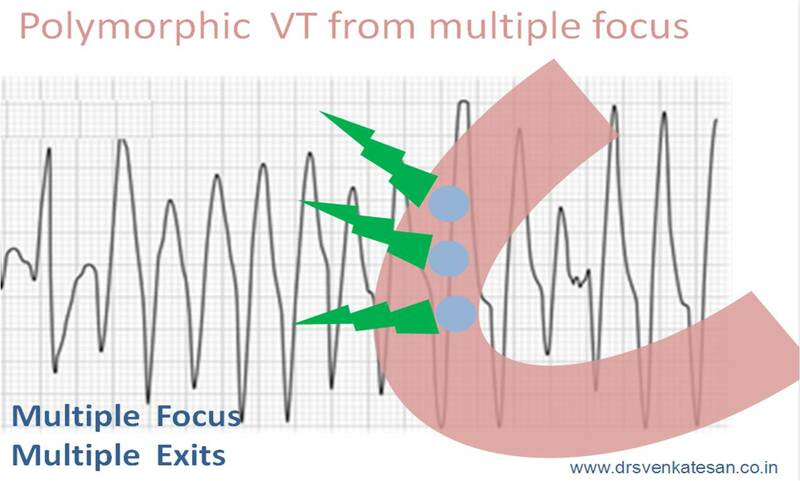 It is possible one focus acts like a natural anti tachycardia pacing for a VT from another focus. Ventricular fibrillation can be termed as an extreme form of irregular polymorphic VT as the wavefront breaks into innumerable fragments each exiting the myocardium at will in a random fashion bringing ventricles to a standstill. 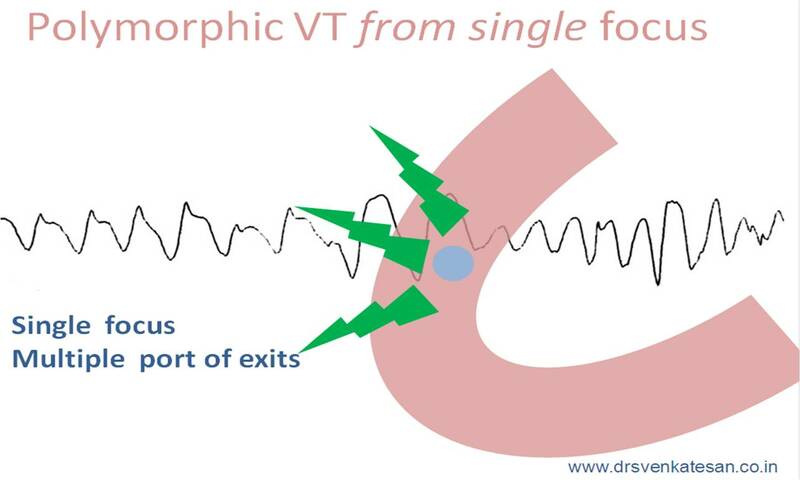 The term multifocal polymorphic VT is generally been abandoned at the bedside as distinguishing it from single focal polymorphic VT is a difficult task*.Still the concept of multifocal VT is alive and kicking in the EP labs , giving sleepless nights to our Electro-cardiologists! *Please note , multi focal VPDs can be recognised with ease by different coupling intervals, but it is difficult to identify during a run of VT .